Aboriginal leaders will talk with the Town Council at its meeting open to the public this evening about an alliance fighting juvenile crime. This follows the robbery of a tourist in the Mall and a violent clash between two youth gangs outside the Catholic Church yesterday. Tonight’s meeting is likely to discuss reviving a long inactive Memorandum of Understanding between Aboriginal interests and the council. 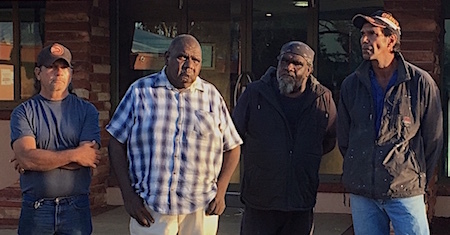 Prominent youth worker and former police office Phil Alice, and Robert Campbell, CEO of Lhere Artepe, the town’s native title organisation, will be among Aboriginal people to make presentations. Mr Alice says he will be “playing more hard, starting at the grassroots” asking the parents why they are permitting their children “to run around late at night. “This is Aranda country,” he says, with its own songs and stories, and children from other tribal groups “should go back to their grandfathers’ country”. Mr Alice says tonight’s discussion will be about how the council could cooperate: “They are not supporting us” while the police are more keenly involved. Mr Campbell says Lhere Artepe’s role is to provide support for a group of senior Arrenrnte men forming a partnership with the council, which could include the police and Tangentyere. Asked why Lhere Artepe is not itself taking an official role Mr Campbell said the organisation is rebuilding and “not at full capacity as yet to take on that role. Other stuff going on from previous years” is still on top of the agenda. As the government is plugging one hole another one is opening up. The Wills Terrace side of Anzac Hill is now flanked by spotlights to discourage stone throwing. Meanwhile what appears to have been two gangs were fighting a running battle outside the Catholic Church and the Youth Centre. The centre is now surrounded by a tall fence with sharp spikes, accessible for young people only on Saturday evenings except if they belong to clubs hiring space at the premises. There is apparently some access to the open area rink. Several young people we asked had no idea what the headquarters, a bit further up the road, of the Youth Outreach and Re-Engagement Team – YORET for short – is all about. On two evenings we checked it was closed, and the sign (below) on the door – “better choices, brighter future” – probably isn’t a great deal of help. About the incidents yesterday police say: “A 14 year-old female has been charged with robbery and being armed with an offensive weapon. A 13-year-old male has been charged with robbery. “At about 4:45pm on Sunday, police received a report of large group of youths fighting at a church in Alice Springs and disrupting the church service. “In the course of the fight an unknown youth struck a 13-year-old youth to the head. PHOTOS (from top): Floodlit Anzac Hill • Mr Alice (second from left) with, from left: Matthew Palmer, Jonathan Conway and Shane Lindner • Police a the base of Anzac Hill after making an arrest. Commander Michael White says police will use an intelligence-led approach to target anti-social behaviour and associated crime, as well as domestic violence and drink driving, “with a focus on engaging young people, proactive patrols of targeted ‘hot spot’ locations. School holiday programs are being coordinated “to maintain young people’s access to and involvement in safe and constructive activities that keep them engaged and ‘off the streets’, and to provide appropriate referrals and support to young people who are assessed as requiring more structured support”. 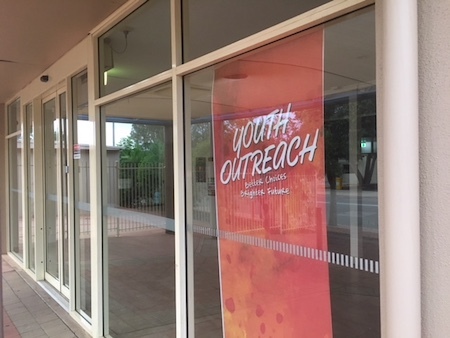 Police will be working with Territory Families’ Youth Outreach and Re-Engagement Teams (YORETs), youth service providers, including the Alice Springs Youth Patrols, Commander White says. Good on you Hal Duell and Evelyne Roullete for not hiding behind some nom-de-plume and standing by your convictions. The hardline “make their parents responsible” line is no more likely to work than the “nanny state warm fuzzy cuddly approach” Chris alludes to. A workable resolution will only come out through collaboration with all parties involved, including the wayward kids themselves who, it would seem, are not considered part of the discussion. Alice needs the whip: Could you define a “Do gooder’ and a “Do badder”? Do you value pair of opposites? Take note that nature knows nothing of our world of opposites. There is no outside and inside unless we draw a line or make fences. Nothing will change while we have politicians at all levels lacking in strength and intellect. We are crying out for immediate action answers and solutions and what has happened? Long term feel good programs that will go the way of all other such programs – nowhere. A few more cops barely enough to cover attrition rates by the time they hit the streets. Lights on the hill a good move but how long will they be there? One thing for sure the nanny state warm fuzzy cuddly approach telling criminals they have done no wrong just made a silly mistake won’t work, it’s never worked any where. If there are no consequences for criminal action and anti-social behaviour the situation will get steadily worse to the point our lifestyle will become third world. Our tourism industry on its knees and we won’t need power outages to have the lights go off. It will be the last person leaving flicking the switch. Totally agree with Phillip Alice and his views of taking it back to the parents of the kids. Why are their kids on the streets at night? Make them responsible. If they don’t belong in Alice, send them all back to where they come from. Well done PHillip. It was interesting to catch a TV news program last night in which we heard that in the future all crimes committed by youth under a certain age will be treated as welfare issues, not police issues. This was followed by another report about youth gangs running wild in the CBD with at least some of the offenders under the announced age of police intervention. It seems they were going so far as to attack the Catholic Church in which a service was in progress in an attempt to steal the church’s musical instruments. Summer is coming, and I predict that under the new system by end of summer we will be hearing pleas from Darwin for vigilantes to stand down. News flash, Mr Gunner: The kids do not respect your police or the local native title holders, and the town council is not even on their radar. Happy holidays, everyone! This youth crime is getting totally out of hand and its time the Aranda elders all got together to form a strong community focus group and encourage parents and kids to be responsible for their own actions. The kids not to be out on the streets late at night unsupervised. Perhaps a bit of help from the Night Patrol would help as well. As for the council, forget it, they are too bureaucratic and self focused on their own little projects to do anything constructive apart from having meetings, forming committees and issuing dozens of reports with no outcome. An intelligence approach would be good. Particularly with the advance of social media and the availability of apps. Many people could not be bothered calling the 131444 number, hoping it gets answered and then explaining exactly where in Alice Spings the problem is. Intelligence based policing would involve an app that local coppers on the beat could have that shows situations trending based on how many people report the problem. Naturally the faster the particular report trends the faster the police could respond. How many times do you see on Facebook sites like ASCOF multiple people commenting on the same anti social behaviours, and how many of those people have bothered to report it? A more interactive role using the latest technology would make responses more fluid and possibly more effective. Mind you, since the Royal Commission came out, I could see the police turning a blind eye to youths on the street, whereas a few years ago they might have called them over for a chat, engaging with them. Now the amount of red tape involved in any youth interaction will simply too much to bear, so drive on by and pretend you saw nothing. Besides, even if it necessitates an arrest, even less will happen than it did before. Do Gooders beware. Anarchy has taken hold. Next comes the gun.